In Meridian, Mississippi, there lives a man who has some amazing baseball memorabilia that not a lot of people know about. He doesn't like the attention, mainly due to the epic amount of memorabilia that he has and the fact that key items had been stolen in the past, but were recovered. I was lucky enough to be on the receiving end of this man's hospitality when he uncovered his rare items so that I could take a look at them over dinner tonight. That man's name is Don McNair. He is the son of former Major Leaguer, Eric McNair, whom I have written about on this blog before. Don't worry, none of these items reside in Mr. McNair's home. They are kept in a safe location under lock and key. I heard about Mr. McNair from a friend and colleague that I work alongside, me being a consultant and the friend being a state regulator. Sometimes the relationship between regulator and consultant is less than amicable, but this regulator and I have developed a great rapport over the years. One day he overheard me discussing my blog with someone and he told me about the man in Mississippi with the amazing memorabilia. I wrote Mr. McNair a letter a while back and got some cool items in return. So, when I knew I would be coming this way on my vacation, I shot Mr. McNair an email and we worked it out so that we could meet up for dinner (along with the father-in-law of said regulator, and my son Chris). Mr. McNair brought a bag of various memorabilia with him as well as a briefcase that housed a good bit more. I plan on breaking up the meeting into several blogs so I can do some of the items justice. 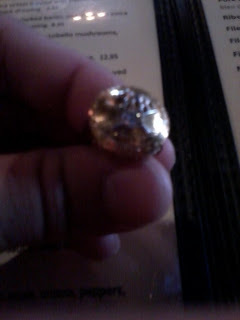 The first thing I noticed when we sat down for dinner was the gold ring on Mr. McNair's finger. I asked him if it was his dad's World Series ring, and, of course, I was correct. So, here you have it, a 1930 World Series ring, given to the members of the World Champion Philadelphia Athletics. You know, the A's for those of you who only know them as being from Oakland. I got to hold the ring in my hand. 82 years old, the ring still looked epic. Well worn in places, Mr. McNair has had it since his dad's untimely death in 1949. 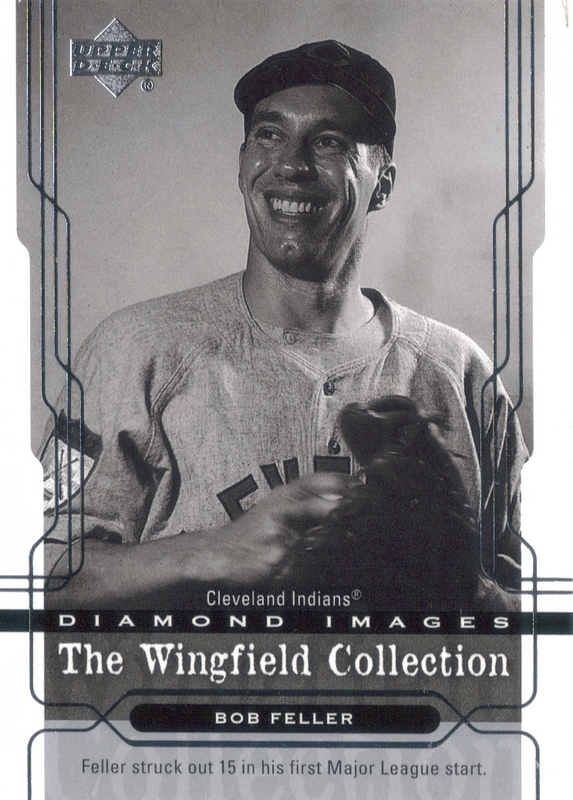 Mr. McNair had an album with a bunch of items from that 1930 team, one of which being this program from the World Series. He also had a ticket stub from that series and told me to take it home with me. I was amazed at his generosity! I will blog the ticket stub when I get back home to my scanner. The 1930 Philadelphia A's are regarded as one of the greatest teams in the history of baseball. Pundits go back and forth between the '30 A's and the '27 Yankees as to which team is the greatest. To put it into perspective, the 1930 A's went 102-52, boasted future Hall of Famers Jimmie Foxx, Al Simmons, Mickey Cochrane, Lefty Grove and were managed be legendary Connie Mack. Even Hall of Famer Eddie Collins was a coach on the team and got into 3 games. The A's lost more than 2 games in a row only twice that season and did not lose more than two games in a row after the 14th of June. Jimmie Foxx led the team with 37 homers followed by Simmons' 36. Lefty Grove pitched to a record of 28-5. Eric McNair, a rookie at 21 years old, would have 63 hits, 0 home runs and a .266 batting average over 78 games. The A's would win the World Series after collecting their second of three pennants in a row. Their opponent in that series, the tough St. Louis Cardinals would bow to the A's after 6 games. I am still amazed at Mr. McNair's hospitality. How many people can say that they were able to hold a World Series ring from 1930 in their hands? I plan on meeting his son, Eric McNair, III tomorrow for lunch and will enjoy more baseball discussion. Stay tuned for a look at some more of the items in Mr. McNair's collection. We were going to try to visit Mr. Trucks tomorrow, but after speaking with his wife this morning, I am going to give up on that idea. Mr. Trucks has requested that he receive no calls or visitors at all. Apparently, he isn't even wanting visits from certain family members. His wife told me that the best that can be done now is to send get well cards to his home address and she will deliver them to him. She did tell me that after he is out of the hospital, he will be going to a rehabilitation center in Birmingham, AL, but after that, he will not be able to return home. He will be put into a nursing home after the stay in the rehab center. She and I exchanged pleasantries after she told me this news, but it really seemed that she was about to break down. I'm not going to lie, I, myself, got pretty teary eyed listening to her discuss his health. It definitely does not look good. I recommend everyone continue to keep him in your prayers, but I believe his days of honoring everyone's TTM requests has come to an end. Instead of requesting autographs from him, I think we should all focus on his health and the well being of his family. I'm very sad that I didn't get a chance to meet him, but I was lucky enough to speak to him on the phone when I did my interview with him a few years ago. He is a great man and has always done everything he could for his fans. Now it is our turn to do for him by praying our hardest that he comes through, or in the worst case, that his pain doesn't last very long and that he doesn't suffer. Well, I can knock another Minor League stadium off of the list after taking in a game at Riverwalk Stadium in downtown Montgomery, Alabama this evening. The ballpark is one of the nicest ones I've been to. THey incorporated the old train station into the design of the park, and I feel like they did a tremendous job. The park looks really cool from the outside, as you can see. It looks even better on the inside. They have the original wood floors inside. The staircase seen below looked really cool also. We saw this as we were escaping the heat. We sat down in the hallway and enjoyed the interior of the building for a bit while everyone else outside melted in the heat. The Biscuits (they are the AA affiliate of the Tampa Bay Rays) played the Mississippi Braves (the AA affiliate of, you know, the Braves) for a 7:05 (central time) game. The game started out pretty even, but then got out of hand in the top of the 8th inning when the Braves put up a 7-spot. The Braves ended up winning 14-5. Chris enjoyed himself, but by the end he had gotten pretty tired. He was ready to go, but like the good trooper he is, he stuck it out. Here, he can be seen after downing a blue sno cone. I had some big plans for my vacation. 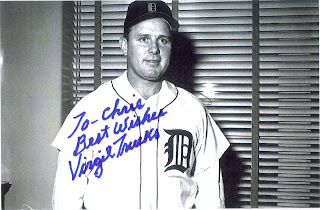 I was going to catch a Montgomery Biscuits game and then I was going to try really hard to meet Virgil Trucks in person. I called his house this morning to see if he would be available to meet up next week and was sad to hear that he is in the hospital after suffering a nasty fall at home. Mr. Trucks broke his leg and hit his head in the fall. I believe it was his wife that I spoke with, and she said that he wasn't doing well at all. At 95 years old, any fall can be devastating. The lady I spoke with said that if things go well, then he should be moved to a rehabilitation center by early next week. If he is well enough to receive visitors, she will allow me to visit (since I have already planned on being in the area). I even offered to give her a ride to the hospital if needed, but she has folks who are handling that for her. I ask that everyone keep Mr. Trucks in your thoughts and prayers. At 95 years old, he has lived a long and full life, but he has been a treasure to everyone that has come into contact with him. I am very upset with this news. I wasn't going to continue this theme, you know, the early picks for the postseason awards, but after my post on Andrew McCutchen, I felt like I had to acknowledge what is being accomplished in Anaheim, or Los Angeles, or Orange County, or California (wherever the Angels are from today). Mike Trout is having probably one of the best rookie seasons on record. 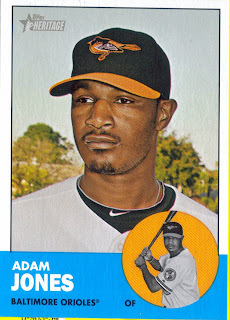 After being called up in May, he has been on a blistering pace, batting .356 with 16 homers, 49 RBIs and 36 stolen bases. At only 20 years old, he is playing like a seasoned veteran. The Angels have certainly benefited from his play as of late. They were floundering until Trout (see what I did there?) was called up. Now they are competing for the AL West crown with the Texas Rangers and look like a sure bet to enter the playoffs, if not the West winners, at least as a wild card. I would imagine that Trout has had a lot to do with that. He might even be a good candidate for AL MVP. I was bored, so I decided to look through my folder on my laptop of the random baseball cards I have scanned over the years for this blog. While looking through the folder, I saw something that caught my eye, a 2009 Topps Career Quest auto of Andrew McCutchen. 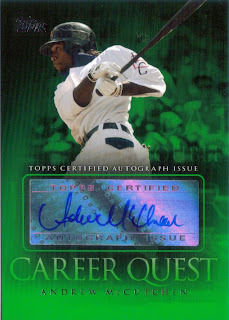 I instantly got mad at myself because if the card was a 2009 issue, then odds were that I had sole it for cheap at one of the card shows back then because I didn't know how big of a star McCutchen would become. I'm so glad I was wrong. I decided to make sure I didn't sell it, so I went through my sale box and the card was nowhere to be found. I, then, went through my 'keeper' box and not too many cards into the box, I found it. Whew, I was smart enough in 2009 to slide the card into a top loader and hide it away with my good stuff. I'm really glad I did now, because McCutchen is really becoming one of my favorite non-Orioles. I'm also glad I didn't sell it because I took a look at completed listings on Ebay and saw that recently, only one of these had been listed and it sold for $39.99. Very nice. Had I sold it at a show, one of the sketchy other dealers would have probably only offered me $5.00 for it. That's the one thing I don't like about setting up at the shows, the guys who come and try to tell you that what you have isn't worth what you've priced it at and they make you feel like they are doing you a favor for buying from you at a 95% discount. Blehh. Anyway, if the season ended today, I don't think it would be too much of a stretch of the imagination that McCutchen would run away with the NL MVP. He is batting .373 at this moment with 22 home runs, 66 RBIs and is leading an improbably Pirates team that looks destined for the playoffs for the first time since 1992. I'm really happy that I didn't sell this card. Sometimes the best deals you make are the ones that aren't made at all. My vacation starts when I head home from work on Friday. On August 4 and 5, we (my wife, son, myself and fellow blogger Ryan) will all be going to the National card show in Baltimore. I'm really excited. This is the reason I haven't bought anything in a while. After purchasing my 3 jumbo boxes of Topps Series 2, I have devoted all of my savings toward paying for my autograph tickets and building a sizable amount to take with me to said show. Chris and I are going to meet Frank Robinson and Ralph Kiner. I already have Kiner on a baseball, but I wanted to be able to say I met him. Same goes for Chris. I thought it would be cool for him to be able to tell people (when he is my age) that he met an all-time great. Kiner is pushing 90, so who knows how many opportunities will come along to meet the guy. I'm still going to get a ball signed by him, so I will have 2. I might possibly authenticate one of them and trade it for another Hall of Famer that I don't have, but I haven't decided yet. I will also be adding a new Hall of Famer to my collection when I have a ball signed by Frank Robinson. For some reason, a ball signed by him has eluded me so far, but that won't matter after I meet him in person and have him sign a ball for me. I am going to sit down over the next few days and make a list of some things I want to look for at the show. I most definitely will be on the lookout for 2009 Topps Brooks Robinson Letter Patches to hopefully finish off my collection. I may also look for some 1948 Bowman to make a dent in that set. Maybe I'll look for another 1951 Topps Red Back set, since, you know, I can't freaking find mine... Maybe some Bowman Bob Fellers. Maybe some Virgil Trucks cards (2011 Wrapper Redemption Auto, maybe?). I'm really excited! I'm also excited about the other part of my vacation, which is pretty much destination unknown right now. I intend to check out some MiLB teams somewhere, but I'm not sure where, yet. Most likely Memphis and/or Nashville, but I'm not ruling out Montgomery, AL, either. I still need to decide. Anyway, I'm excited, as you can tell. I'll be looking for cards for certain friends of mine as well. You know who you are! Hey Look! A Trade With Nick! I got my first package from a fellow blogger in quite some time on Saturday; it was a package from my friend Nick over at 'Baseball Dime Box.' Nick is a really good guy whose blog has quickly become one of the better ones around. He has a ton of regular features and his writing style is simply amazing for a guy who is so young. Head over there and check it out. I send Nick packages of cards at random and the cards I send him are pretty random as well. He enjoys the thrill of a good gem, found among a sea of 'junk wax' and I enjoy finding cards which I feel that he would enjoy. In exchange for my many packages, Nick sent me a stack of Orioles cards that he found during some dime box digs. 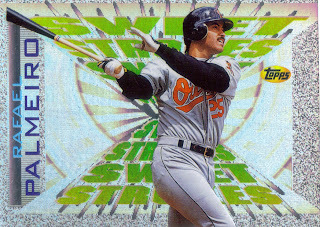 This 1997 Topps Sweet Strokes Rafael Palmeiro is a really nice card. It looks even better in person. The cars actually looks as if it had come out of a more recent pack, instead of 1997 Topps. 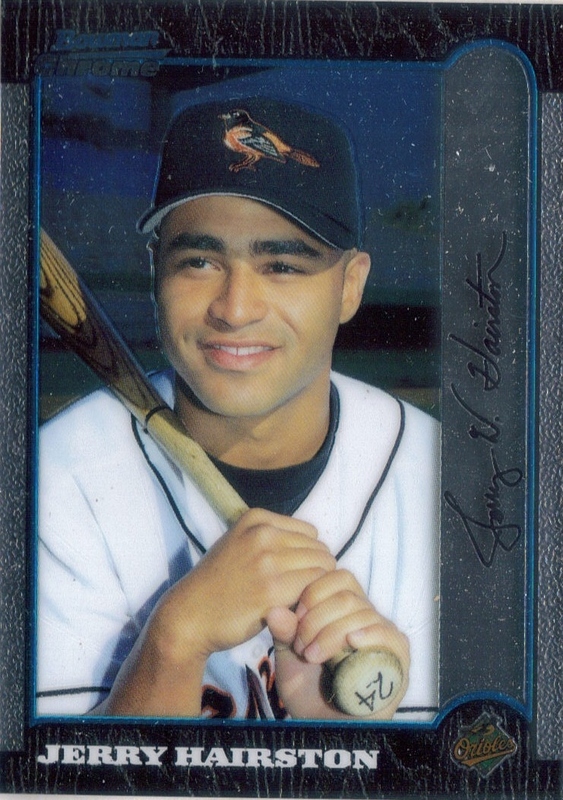 Here is a 1999 Bowman Chrome Jerry Hairston card. Hairston has gone on to have a pretty decent career as a journeyman infielder, even winning a ring with the 2009 Yankees. Hairston, you may remember, is the guy who Brian Roberts beat out to become the Orioles' starting second baseman beginning in the 2004 season. Personally, I preferred Roberts back then and even today with all of his injuries, I still prefer Roberts. Nothing against Hairston, but the North Carolina born Roberts will always be one of my favorite Orioles. 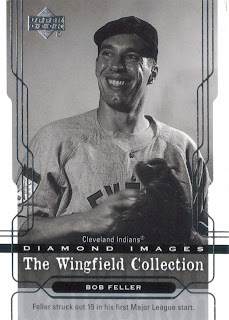 Nick also added a nice 2004 Upper Deck Bob Feller. 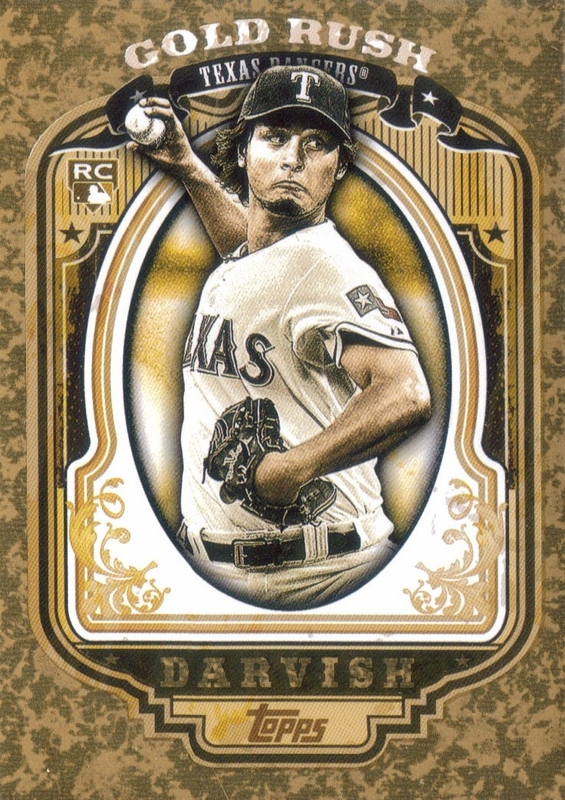 This is a really cool card that I did not yet have in my Feller PC. I intend to expand my Feller collection and hopefully will build a page on here showcasing some of my Feller cards. I'm getting there. That will hopefully commence once I find my '51 set. Yeah I haven't found it yet, still looking. 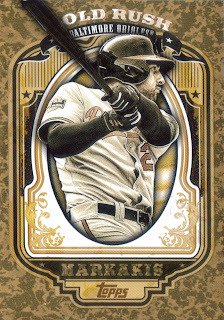 Finally, Nick included this 2012 Topps Gold Nick Markakis. 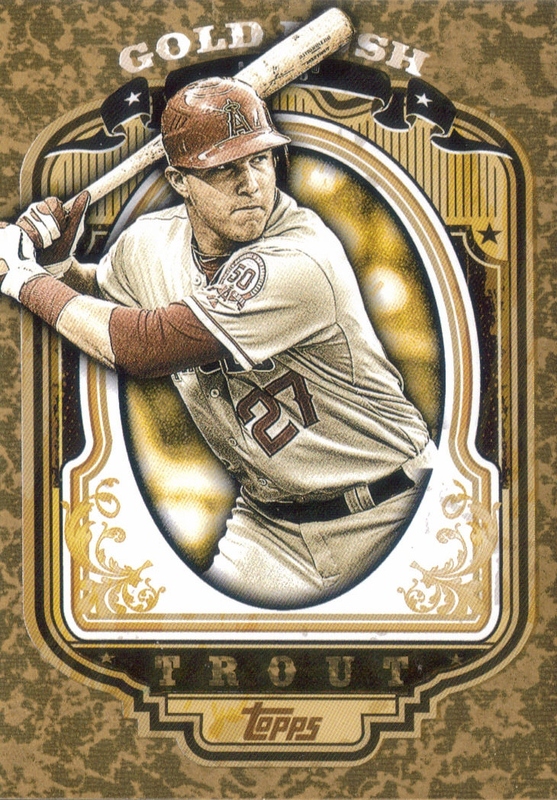 I love the gold cards from this year and the diamond ones from last year. I'm hoping the 2013 flagship set can build on the quality of parallels that we have seen from the last few years because these are simply some nice cards. Thanks again for the awesome stuff, Nick. I'll hopefully find you some more cool stuff as I continue to purge my collection and as I head to some more shows. Well, one plus that can be found in my plight of the missing Red Backs is that I'm bound to uncover some hidden gems in my collection and resurrect an old blog theme. I'm not sure if any of you missed the feature, but it looks like I will be attempting to bring it back. Who knows. 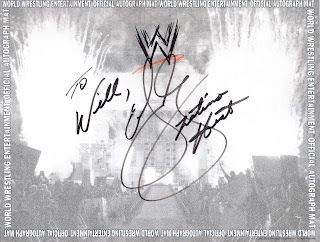 Anyway, while I was checking the drawers of my china cabinet, I came across this autograph that my good friend Mike picked up for me back in 2003. Yeah, this isn't baseball related, but as many of you know, I really enjoy wrestling. 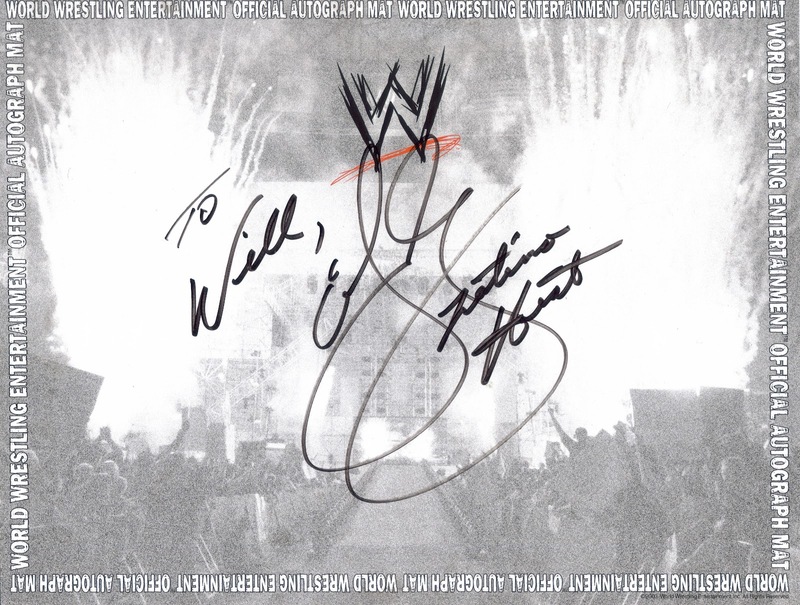 This autograph is of former WWE Champion and crowd favorite, Eddie Guerrero. Guerrero (b. 1967 - d. 2005) was a member of the famous Guerrero wrestling family and gained fame while wrestling in Mexico and Japan before heading to the now defunct WCW. He wrestled in WWE from 2000 until his death in 2005. Guerrero was known as a villain, but his charisma and wrestling skills won him the respect of wrestling fans around the world. He had battled addiction throughout the final years of his life, but toward the end, he cleaned himself up and became a born again Christian. It appeared that he had turned his life around until his nephew Chavo Guerrero found him unresponsive in a Minneapolis Minnesota hotel room. When paramedics arrived on the scene, he was pronounced dead. I remember that as being one of the saddest days I had ever experienced as a wrestling fan. I still watch the Youtube video from the next night's Monday Night Raw where WWE Superstars paid tribute to Guerrero with a 10-bell salute. Here is the link to the tribute, in case anyone was curious. Well, I had that feeling last night and it has carried over into today. 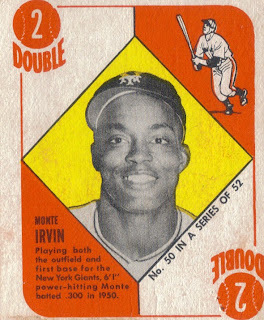 I was going to blog, card for card, my 1951 Topps Red Back set. The sat has been on the top shelf in my safe for YEARS. I vaguely recall (after going to my safe to get the cards) that I took them out and put them aside so I could scan them a while back. It appears that they never made it back into the safe. I have torn my computer room (which, in all fairness, is my actual card room) and I have torn apart the man cave in a desperate attempt to locate the set. All 52 cards are in loose album pages which have been kept inside a purple manila folder all these years. My wife vaguely remembers me pulling them out to scan and saying that I was going to put them in an album so they would be easier to find. Heh. Well, they aren't in any of my albums. I swear I put them with a number of other things (my oversize Brooks Robinson cards and some other stuff like that come to mind) and shut them inside SOMETHING for safe keeping. Oh, they're real safe alright, they're even safe from me. I sincerely doubt I lost them in the move. I also sincerely doubt they've been ripped off because I don't have any sketchy friends. They are in my house. Somewhere. Anyone want to come over and help me look for them? I've noticed lately how easy it is to neglect one's blog. I've been sick, I've been painting a ceiling, I've been at the beach, etc etc. Most importantly, I've been bored. Not bored in general, mind you, but bored with the blog. I have had very little coming in lately due to saving money for my upcoming vacation. I am working really hard on not using the credit cards at all for this trip, so I am saving like crazy. 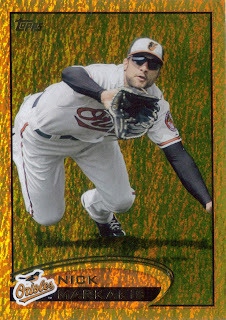 I am going to the National Card Show in August with Ryan from O No Another Orioles blog. All of this down time has made it a bit easier for me to understand how bloggers can drop off the planet, so to speak. Have any of you noticed how some bloggers just seem to disappear? Etc, etc, etc. There are too many to count. Just guys who went off into the sunset. I know where Pete is, he got married, and I chat with him on facebook. But these guys aren't the only ones. There are a ton of good bloggers whose voices are now silenced. I wonder to myself why. Maybe they don't have time anymore. Maybe they don't have the money. Maybe they just burned out, which is kind of how I was feeling. At one time, I was posting at least once a day. Now, it is a constant struggle to find something meaningful to write about. I don't want to become boring, so I try really hard to come up with some interesting posts. I have noticed that I do a fair enough job of informing all of you about older players (be it TTM or whatever) who time might have forgotten. I have become a pretty decent voice for them. I also do the occasional trade. My trade emails are few and far between now. I feel like a lot of that is due to my just sending stuff to people at random and not doing a good job of updating my trade page. That's my fault. Not a lot of people seem to have what I want anyway. I would really love someone to email me and say that they have the Brooks Robinson patches I need, or some 1959 or 1969 Topps for my sets. I don't need anymore Orioles from the mid-2,000's. I can't give away all of my Jay Gibbons and Miguel Tejada cards fast enough. Anyway, I'm still here. I still have a voice. I've not faded off into the distance yet. I still have older players I need to advocate. I still have TTMs that I want to get. I still have sets to build. I'm not going anywhere. Things have slowed down to a crawl over here. No new cards or trades have come in. No TTMs have gone out or come in lately. I'm still a bit under the weather. Chris is out of town visiting grandparents, so I am enjoying some quality time with the wife. She and I rode to the LCS today so I could pick up a few packs of 2012 A&G to see what the fuss is about. I picked up 4 packs at $4.50 a piece and my second pack yielded a Cal Ripken for my collection. Very nice. I used to be hot for A&G. I remember when it debuted in 2006 and was the product of the year. I had put together the set each year up until 2010. I began to sour on A&G in 2009 when the infamous printing issues cropped up. Remember the lines on the cards? Those really got on my nerves. I didn't buy but maybe 4 packs of 2011 A&G last year. I'm pretty much over the set, now. That being said, I do like the design of this year's set. They look nice, much like an A&G card should. I might purchase a box at some point; but as of right now, I'm in full save mode. I paid myself back pretty quickly for the money I spent on 2012 Topps Series 2 and have now rolled that on to autograph tickets for the 2012 National Card show. I have almost paid myself back for that stuff as well, meaning, if I can build a nice surplus to take with em to the show, I might be able to find a lot of blog worthy cards and such while I am there. So, I have to sacrifice. No boxes to bust, no HOF baseballs to buy, no Ebay purchases up until the end of the month, then I can splurge at the National. Plus, that is my vacation time as well, so I need to save for that, too. Once all of this is said and done, I should be back into blogging full time by the end of the month. We'll see. Might need you guys to hook me up with some trades to keep me writing. However, here we sit, halfway through the 2012 season and the Orioles are in second place. Yeah, ok, they crawled to the halfway point after being bludgeoned by the Angels, three of their original starting 5 rotation members have taken the shuttle to Norfolk, yet, they are still above .500 and hold a wild card spot. Wow. They are even poised to be buyers at the trade deadline. In years past, the Orioles have been perpetual doormats for the AL East. Now they are linked to Zack Greinke and Wandy Rodriguez. They obtained one of my favorite all-time non-Orioles (Jim Thome) for a could minor leaguers. Furthermore, oft maligned owner Peter Angelos has let Dan Duquette know that he is committed to winning this season 'no matter the cost.' That in itself is a refreshing change. I'm not going out on a limb and saying that the Orioles will continue to hold one of the playoff spots. I'm just savoring the moment, like every Orioles fan should. We aren't used to this. The Orioles haven't put together a winning season since 1997 (their last trip to the post season). I'm savoring every moment of this and enjoying it while it lasts. There have been ups and downs this season, but there is much more promise for the future than in years past. Let's hope we can ride this wave as long as we can. So, what is your biggest surprise to this season? Leave me some comments, I'm interested in seeing what everyone else thinks. This, for sure, has been an interesting season so far. Last weekend, when I went to visit my family for my parents' anniversary party, my oldest brother and his wife gave me something they picked up for me when they had visited Myrtle Beach. These are the same folks who sent me the awesome signed baseball of my nephew while they were on vacation. Anyway, since it rained during 99% of their trip to the beach, Kenny and Gina checked out a lot of shops in the Myrtle Beach area that they wouldn't have normally checked out had the weather been nice. You know, because they would have been laid out on the beach. Well, in one of the shops, my brother saw several baseball related tin signs for sale so he had his wife give me a call to see if I would be interested in any of them. She texted me a picture of this sign and I was really happy because it is a replica of the Topps advertising signs they used in 1955. If you have followed this blog for a while now, you'll know that I hold a special place in my heart for the 1955 set... seeing as I blogged it card for card for the entire set. So, I had to own this sign, and my brother and sister-in-law were awesome enough to pick it up for me. They are becoming frequent contributors to the blog now... first with Gina hooking me up with a Paul O'Neill autograph, then the signed baseball from IAN! and now this awesome sign for the man cave. Maybe the next item will be a trophy from my brother's first race win... ;) Wouldn't that be awesome! No, I know once Kenny wins his first race, that trophy is going right in the middle of his living room... right, Gina? Oh, I know you guys love the super seventies orange bedspread behind the sign. Well, you can't have it because it's mine! I meant to post these yesterday, but I still wasn't feeling all that great, so I put it off until today. Of course, today, they would have been posted sooner but when I scanned them, I noticed that I needed to clean up all of the pictures on my laptop. So, I did that, then we decided to make a trip to the beach for the afternoon. Anyway, here I am, a little late. I had enough jumbo wrappers from Series 2 Topps to get 2 Topps Goldrush packs. 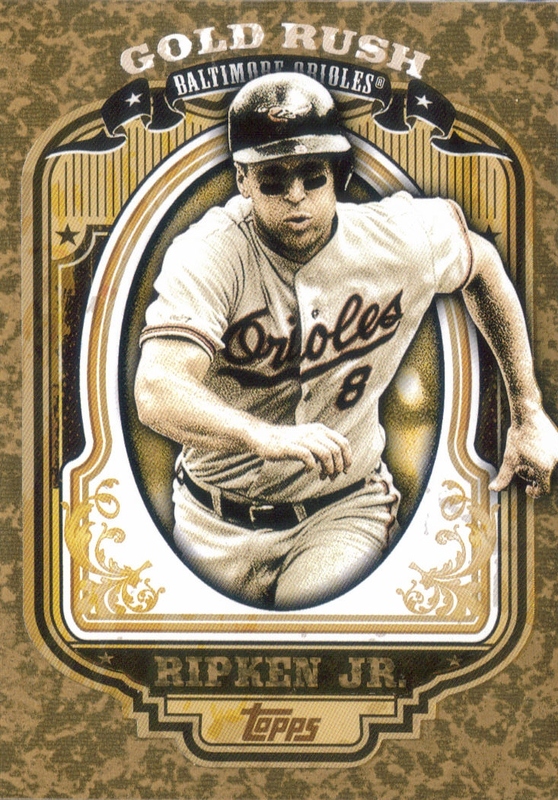 I was really happy that the first card I saw was this Cal Ripken. 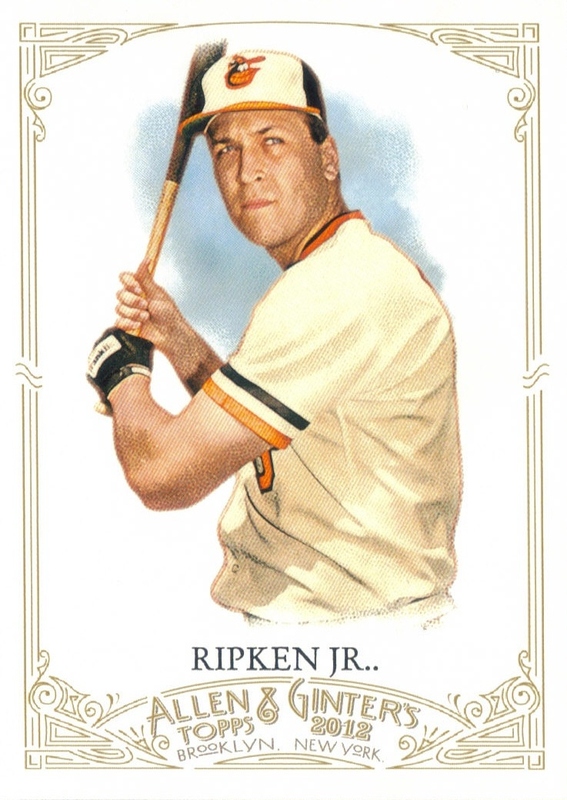 Again, it is always nice to add a new Ripken to the collection. 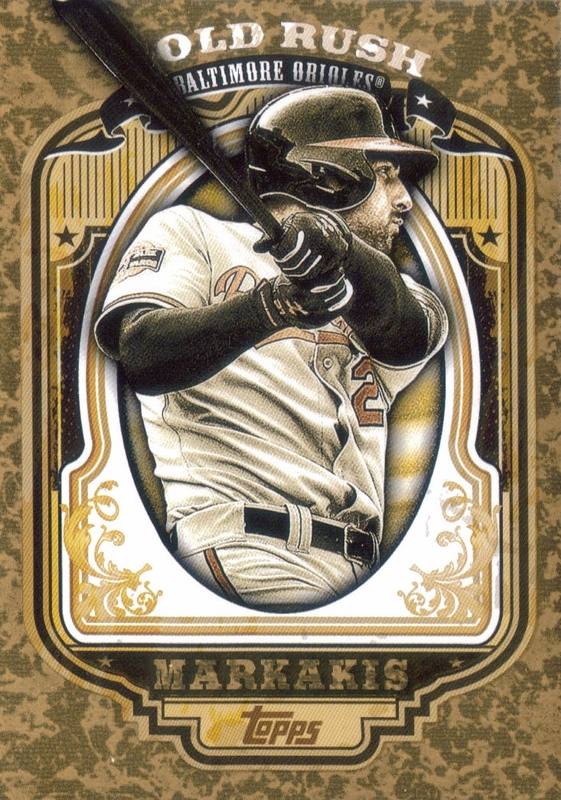 I also got this Nick Markakis. 2 Orioles in one pack, not bad at all. I think this Mike Trout was a decent pull. I think it will be some good trade bait or a good sell at my next card show. 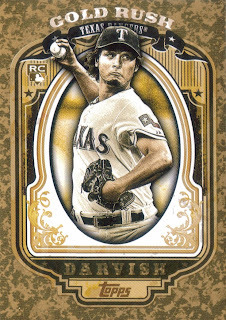 Another decent pull is this Yu Darvish. I saw that it is selling on Ebay for around $22, so that is definitely worth it to me. More trade bait! Or sell bait. Whatever you want to call it. Anyway, I liked this year's wrapper redemption cards, even though I didn't pull an auto. I still want to get the Virgil Trucks auto from last year's wrapper redemptions. If anyone has one of those, please shoot me an email. After taking a much needed and well deserved break, I had one of my padded mailers waiting for me in my mailbox this afternoon. Inside my mailer was a signed baseball from Dodgers and Padres legend, Steve Garvey. The 1972 NL MVP, Garvey (b. 1948) played in the majors from 1969 to 1987 for the Dodgers and Padres. 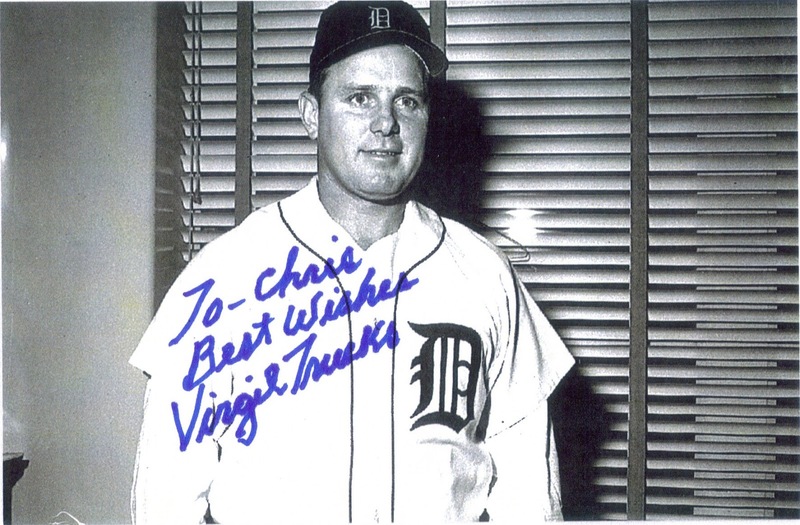 He retired with 2,599 hits, 272 home runs and a lifetime batting average of .294. He won the World Series in 1981 with the Dodgers. Garvey failed to be elected to the Hall of Fame in his 15 years of eligibility, garnering at most 42.6% of the vote in 1995. He is a likely candidate to be elected when his turn comes via the Veterans Committee. Garvey is my 62nd TTM success. I mailed to him on June 26, 2012 and got him back today, July 5, 2012, making him a 9-day TAT. Not bad considering there was a holiday in there. Also, I apologize for not posting much lately. I haven't had much to write about, I've been sick and I've been scraping and painting the ceiling in Chris' bedroom. I plan on being back, now. I got my 2012 Series 2 wrapper redemption packs in, so that could be my next post, unless I get another TTM tomorrow. We'll see how I am feeling. Anyway, leave me some comments, I missed you guys, even though it has only been a little over a week.